Browser Security is the PUP that uses misleading techniques to prevent removal. Use Reimage to locate malicious components and get rid of them faster than with uninstall instructions. A full system scan blocks virus reappearance and prevents traffic to malicious domains. Browser Security (also found as Browser-Security) is a deceptive ad-supported application that you should avoid by any means. This program falsely promises to protect your computer from unwanted intruders, such as adware, potentially unwanted programs, ad-supported applications and various useless toolbars. In addition, it even promises to prevent you from entering malicious Internet sites and block phishing attacks. 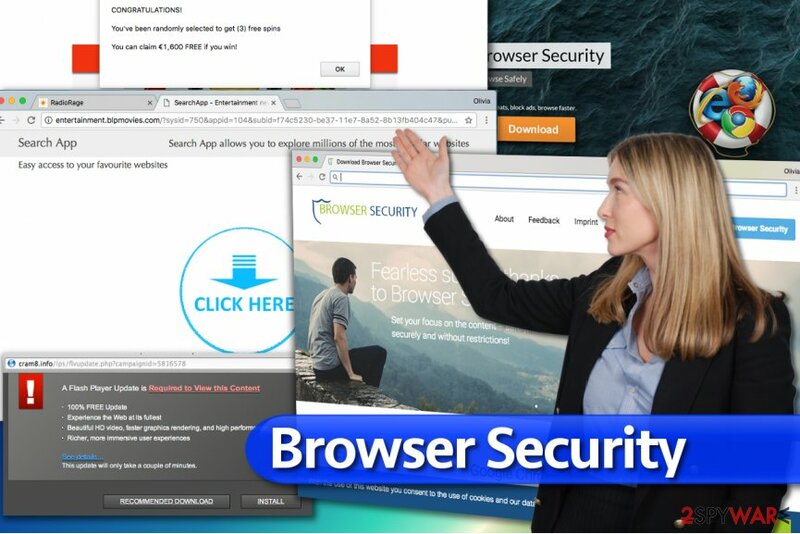 Browser Security may, at its own discretion and for its causes, include within Service any links for 3rd party websites, advertisements or links for applications (3rd Party Content). Browser Security does not warrant for 3rd Party Content or availability thereof nor does it endorse it. Browser Security may change your default search engine to add Browser Security's (or any of Browser Security's affiliates) search engine. It looks like this untrustworthy program may change your default search engine and try to redirect you to predetermined websites. This can be dangerous as you can never predict what website you will be redirected to. Bear in mind that ad-supported applications hardly ever care about user's privacy or security and they do everything to promote third-party content as actively as possible. Therefore, if you do not want to be interrupted by never-ending pop-ups, fake search results and browser redirections during your browsing sessions, consider two Browser Security removal options we provide in this article. If you are ready to remove Browser Security manually, just scroll down and start reading instructions prepared by our team. In case you are not confident about your spyware and malware removal skills, just pass this task to Reimage or Plumbytes Anti-MalwareMalwarebytes Malwarebytes software. Browser Security is a deceptive application that can be found under Browser Security or Browser-Security names. It acts as a typical PUP that displays ads and changes browser's homepage and default search settings. Browser-Security appears to be another potentially unwanted program dubbed similarly as the previously-described PUP. Once installed, it creates a folder in C:\Users\[user's name]\AppData\Roaming and drops several associated files, including an uninstaller. Unfortunately, it is unknown whether the provided uninstaller works properly and manages to delete all components of this suspicious spyware variant. Technical analysis of Browser-Security virus shows that the program silently communicates with a remote website in Germany. It is possible that certain details about the infected host and/or user's online activities including search queries, browsing history, and other information is being transmitted without user's knowledge. Therefore, we do not recommend keeping this suspicious program on the system. You should remove Browser-Security and all of the files related to it using the anti-spyware or anti-malware software. This way, you will get the most reliable system clean-up results. Also, you may have installed additional spyware alongside this adware-type application, and detecting it can be hard. 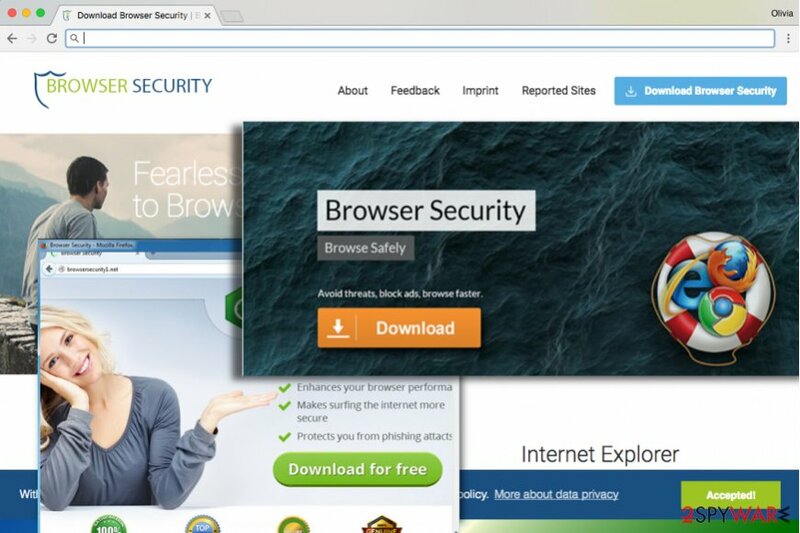 You can easily download BrowserSecurity from its official website or you can add it to your system while installing a freeware. In other words, this ad-supported application may travel bundled with freeware and shareware as an extra attachment. This potentially unwanted application often relies on such unfair and unethical distribution techniques. Therefore, if you want to protect your computer, you should closely check every single program that you want to install and unmark all unfamiliar attachments that it may carry. We highly suggest choosing Custom or Advanced installation options to decompose the software bundle you may have unknowingly downloaded. As we have mentioned before, this application is the exact opposite of what it is claiming to be, therefore, we highly recommend not to install it by any means. If you have already done it, remove Browser Security using expert guidelines provided below. If you see an increased number of ads on your computer screen as you browse the Internet, you should check your recently installed programs, remove the suspicious ones and scan your computer with reliable anti-spyware program. If you are determined to delete the adware manually, follow the steps below and do as instructed. Otherwise, rely on automatic Browser Security removal tool that our experts recommend choosing. Follow the provided instructions to remove Browser Security virus and related spyware-type programs. When in the Add/Remove Programs/Uninstall a Program, look for recently installed/unfamiliar applications, such as Browser Security, SafeSaver, SupTab, ValueApps, Lollipop, Software Updated Version, DP1815, Video Player, Convert Files for Free, Plus-HD 1.3, BetterSurf, Trusted Web, LyricsBuddy-1, Media Player 1.1, etc. Here, look for Browser Security or any other recently installed suspicious programs. Wait until you see Applications folder and look for Browser Security or any other suspicious programs on it. Now right click on every of such entries and select Move to Trash. When in the new window, check Delete personal settings and select Reset again to complete Browser Security removal. Once these steps are finished, Browser Security should be removed from your Microsoft Edge browser. Delete unwanted extensions and plug-ins from Firefox and then refresh the browser using the instructions provided below. Here, select Browser Security and other questionable plugins. Click Remove to delete these entries. Now you will see Reset Firefox to its default state message with Reset Firefox button. Click this button for several times and complete Browser Security removal. We highly recommend deleting vague browser add-ons installed without your permission. You can clean up your Chrome browser with a help of the given Browser Security removal guide. Here, select Browser Security and other malicious plugins and select trash icon to delete these entries. Click Reset to confirm this action and complete Browser Security removal. Here, select Extensions and look for Browser Security or other suspicious entries. Click on the Uninstall button to get rid each of them. Here, look at the Homepage field. If it was altered by Browser Security, remove unwanted link and enter the one that you want to use for your searches. Remember to include the "http://" before typing in the address of the page. Now you will see a detailed dialog window filled with reset options. All of those options are usually checked, but you can specify which of them you want to reset. Click the Reset button to complete Browser Security removal process. ^ Fahmida Y. Rashid. How to identify the different types of phishing attacks. CSO Online. Security News. ^ Sabrina Berkenkopf. "Potentially Unwanted Programs": much more than just annoying. G Data Security Blog. Latest News about Malware, Threat Analysis. This entry was posted on 2017-11-06 at 11:06 and is filed under Adware, Viruses. You can quickly scan the QR code with your mobile device and have Browser Security manual removal instructions right in your pocket. How did you remove Browser Security?